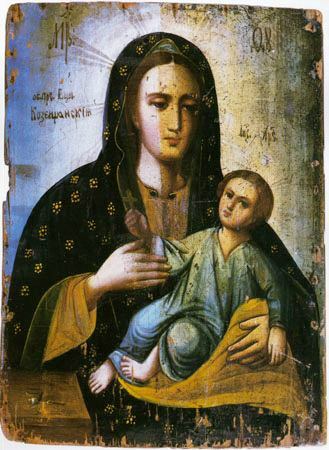 The Kozel'schansk Icon of the Mother of God belongs amongst the icons most recently glorified, and is amongst those most venerated. This icon is of Italian origin and was brought to Russia by one of the courtiers of the empress Elizaveta Petrovna (1741‑1761). The owner of the icon married a records-clerk of the Zaporozhsky-Cossack army, Siromakh. Therefore down to the Ukraine went the icon. During the XIX Century it belonged to the Kapnist family among their sacred possessions. The icon was situated in the village of Kozel'schina, Poltava governance. During Cheesefare Week in the year 1880, the daughter of V. I. Kapnist, Maria, fell grievously ill. The local doctor diagnosed an insignificant problem of the foot, from an improper swaying towards the side, and he prescribed a plaster cast. A certain while later they brought her to a Khar'kov surgeon. He likewise diagnosed the same problem. To lessen the problem with the foot during walking, a special shoe was made with steel springs, set with bracings for the foot above the knee, and the use of warm compresses was also prescribed. Lent passed, but the sick girl did not sense any relief. After Pascha, Maria sensed a terrible weakness in her other foot, which became distended like the first. V. I. Kapnist again turned to the doctor, who found in the left foot a dislocation, and he likewise put on this foot steel springs, advising him to take his daughter immediately to the Caucasus for the curative mineral waters and mountain air. The journey to the Caucasus and the curative-treatments caused even greater affliction. The powers of the daughter failed, she lost all feeling in her hands and feet and did not even feel pinchings. Under observation, besides the former problems, there were found dislocations even in her shoulder joints, in her left hip and extreme sensitivity in the spinal column along its whole extent. With such an advanced degree of the illness, and ignorance as to its cause, they were compelled to return home. In the month of October the father journeyed with his sick daughter to Moscow. Here he had recourse to the most reknown doctors, who declared that the sickness was beyond their powers. The parents and the sick girl began already to despair. But unexpectedly the opportunity presented itself to turn for help to a foreign professor. Since it would be a prolonged while before his arrival in Moscow, the sick girl asked to return home. The father sent her off to the village, having the promise of his wife to bring their sick daughter back to Moscow, at such time when he received news of the arrival of the professor. On 21 February 1881, they received a telegram, that the professor had arrived in Moscow. Such news alarmed the sick girl: would he, like the others, turn out to be powerless to help? The mother, having decided to go on the following day, and pointing to the family image of the Mother of God, said to her daughter: "Masha [a diminutive for "Maria"], tomorrow we go to Moscow, take the image of the Mother of God, let us clean its cover and pray harder before our Mediatrix. Ask, that we make a good trip and that thy illness be cured". The sick girl herself, having lost hope in worldly physicians, placed all her hope in God and entrusted her fate to Heavenly help. This icon had long before been known as wonderworking. According to tradition, it particularly aided young women, who recoursed to it in prayer to have an happy family. And with this too was the custom, to clean the cover of the icon, and the one praying would wipe it with cotton or linen. Pressing the holy icon to her bosom, the sick girl, with the help of her mother, rubbed at it and poured out all the burden of her infirmity, and sorrow and despair of soul before the countenance of the Mother of God. And the ardent and intense prayer of the sick girl was heard. She at once felt the strength in her hands and her feet and she cried out loudly: "Mama! Mama! I feel my feet! Mama, I feel my hands!" She tore off the metal braces and bandages and began freely to walk about the room, all the while continuing to hold on reverently to the image of the Mother of God in her hands. The parish priest was summoned at once and a molieben of thanksgiving was made before the image of the Mother of God. The joyous event quickly became known throughout all the surrounding villages. The mother set off to Moscow with her now healthy daughter and took with them the holy image of the Mother of God. News of the healing quickly spread about Moscow and people began to throng in numbers to the hotel at first, and then to the church, where they had transported the icon. From the icon occurred yet several more healings. When the family returned home to Kozel'schina, all the surrounding areas had already learned about the healings from the Kozel'schansk icon of the Mother of God done at Moscow, and many gathered to venerate the icon. To keep the icon at home at longer was impossible, and with the decision of His Grace Ioann, Archbishop of Poltava, on 23 April 1881 the icon was transferred to specially constructed temporary chapel. Every day from early morning there was never a silent moment before the image, with the singing of moliebens and reading of akathists. In 1882 a church was built, and by the confirmation of the Most-Holy Synod of 1 March 1885 a women's monastery was established – on 17 February 1891 transformed into the women's monastery in honour of the Nativity of the MostHoly Mother of God. At the present time the Kozel'schansk Icon of the Mother of God is located in the Krasnogorsk Pokrov (Protection) women's monastery (Kiev diocese). And for the Kozel'schansk Icon of the Mother of God there has been compiled a Service (on 21 February) and an akathist.